Great job! Glad to hear that the injury is not serious. 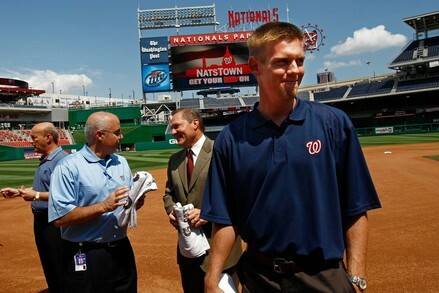 There has truly been a lot of media hype around Stephen Strasburg. I hope that doesn’t influenence the Nationals to rush him to satisfy the media or us the fans. I would rather wait to have a healthy Stephen Strasburg that has fully recovered from his injuries and is prepared for the Majors. I can only begin to imagine what can happen in 2011 with a healthy Stephen Strasburg and a healthy Jordan Zimmermann in the rotation. Let’s go Nats! !